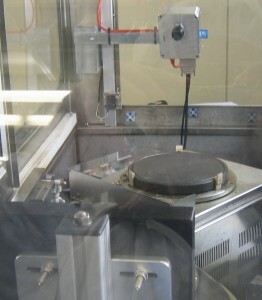 System based on camera AceSmartCam, designed to inspect and control the quality of the application of the layer of glue on silicon wafer. This test has the aim to avoid the generation of defects of shape and thickness in the processing that the machine performs downstream of the glue application. In the case of large defects or repetitive, as well as the activation of the output that result in the blocking of the machine, the camera sends to the server that manages the dispatch of messages on the display a string, or a message that motivates the hang of the machine and indicates the operations to be performed. In addition the camera uses the Ethernet network interface to save data on the analysis performed allowing a constant monitoring of the operation of the system for the preparation of statistics and for the verification of the types of defects that occur during the preparation of the glue.